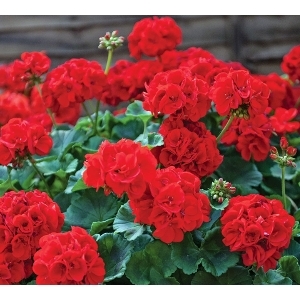 Whether indoors or out, geranium care is very simple. In addition to watering, which should be done deeply and once the soil begins to feel dry indoors or at least weekly outdoors (though potted plants may need daily watering in hot weather), fertilizing is usually necessary. Regular deadheading of spent blooms will also help encourage additional blooming. When watering outdoor plants, it’s best to avoid overhead irrigation, as this can lead to pests or disease issues. Geranium plants root easily from cuttings.